This bearing manufacturer, along with other companies that supply bearings and hardware to aerospace customers, is in a perfect storm of sorts. The combination of a limited number of approved suppliers coupled with delayed launches of Boeing’s 787 “Dreamliner” and Airbus’s A380 have overloaded suppliers. To further aggravate the problem, the market is seeing sharply increased demand from military and commercial sectors needing replacement bearings for ongoing operations. While the problem isn’t limited just to bearings, the technology to produce, test and qualify bearings isn’t exactly common knowledge. So, it will likely be some time before this sector could see relief, even if new suppliers were to begin production. The current lead time to purchase some aerospace bearings extends over a year, and some suppliers are quoting lead times in excess of 75 weeks. To help mitigate the problem, Emerson Power Transmission implemented a process called flat honing in March, 2008 to create capacity and improve capability so the plant can meet the changing needs of the market. The new production method will improve short-cycle deliveries while bringing with it some unanticipated quality benefits that open new doors into new markets, the company says. Developed by Stahli (Lake Zurich, Illinois), the flat honing process may resemble lapping or grinding. In reality, however, the only similarity is the relationship between the workpiece and the wheel. That, and the fact that abrasive media removes metal. The unique marriage of frame rigidity, abrasive wheel construction and part motion has been in the works for some time. The combined synergy reduces setup time and improves delivery while giving the operator greater control over stock removal. Bearing races loaded into the machine are honed with planetary kinematic motion to remove material evenly and use all of the exposed wheel surface. DEEP ROOTS OF SUCCESS With a quick look from the outside of the building, one could say that Emerson Power Transmission looks like many manufacturing shops in America. Once inside, a glance at the large product show case reminds observers that this company put down deep roots in bearing manufacturing by combining innovation and hard work. Since its formation more than 103 years ago, deep roots have helped this company not only withstand storms, but also overcome obstacles while excavating roads into new markets. Emerson Power Transmission employs more than 200 people in its Valparaiso, Indiana location. Although the business has occupied many buildings in this area over the years and has other locations, Emerson Power Transmission had aerospace in mind when it broke ground in its current location. The company collaborated with its primary aerospace, military and defense customers to incorporate design elements that promote product accuracy and part-to-part consistency. These include climate control, central coolant supply and collection, and vibration isolated inspection centers. James H. McGill originally founded what would become Emerson Power Transmission in the Chicago area around 1900. In the early years of the business, dreams of airplanes and aeronautics would seem out of reach. He moved the business to Valparaiso in 1905. By 1928, the company had become a respected brand in the automotive market and served customers such as Duesenberg, Cord, Packard and Rolls-Royce. McGill’s sterling reputation with automotive applications caught the eye of Army engineers, who began using McGill bearings in demanding tank applications early in 1940. Success with tank bearings, along with patented innovations such as the anti-friction cam follower bearing and its successor, the cantilevered cam follower bearing, earned McGill a key place in fixed-wing aircraft designs. In fact, during World War II, all production at all McGill locations supported the war effort. The bearing market, then as now, faced severe shortages. McGill’s bearings were so critical to military missions that the U.S. government required the company to license many of its competitors to make the components. McGill cam follower bearings became a fundamental building block in fixed-wing aeronautic designs. Some of the original product series is still in use today. Currently, Emerson Power Transmission serves its core base of aerospace, military and defense customers from its Valparaiso location. 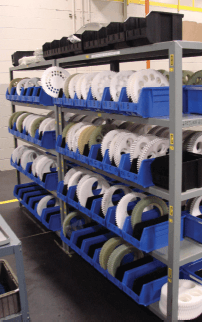 The company uses this location for new product development as well as production as it expands its business into rotary-wing product applications markets that serve helicopter manufacturers like Bell, Sikorsky and Agusta/Westland. Making the transition from older, established markets into newer more sophisticated ones requires the company to build upon past success and prepare for the hurdles of the future. This step requires some changes in thinking. The search for the newest technology brought Mr. Keim and his manufacturing team to a neighboring factory that makes off-road construction equipment. During the visit they noticed the Stahli flat honing process making parts similar to theirs. A closer comparison of the old flat grinding process with the new flat honing process shows why this transition was so urgently needed. The flat honing process is capable of holding sub-micron tolerances while removing stock as fast as flat grinding, making it ideal for running the smaller lots that Emerson’s customers demand. While setups on the old grinding process used to take as long as an hour and a half, the new process can be changed in about five minutes. The reduction in setup time alone has done much to alleviate bottlenecks in crucial grinding centers. Flat grinding is the most critical operation in the manufacturing process because every subsequent grinding and honing feature is established in reference to the surfaces generated at this stage. The old grinding process was capable of holding ±0.0002 inch accuracy with surface finishes around Ra 20 micro-inches. Holding this level of accuracy would often require extra finishing passes—extra passes that cost money. This cell also required a very good machinist at the controls to obtain the best possible quality because it needed constant attention. Maintaining this sort of mental effort can be taxing for even the most experienced operators, and rework was often necessary. 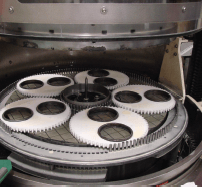 When installing the flat honing machine, the company chose to make a set of carriers to accommodate nearly every combination of part diameters. Once flat grinding gets the overall height of the races to meet print specifications, honing is necessary to improve the finish. The old honing process looked much like lapping, with loose abrasives in a slurry and the accompanying mess. While it was adequate to improve finishes to print requirements, it was unable to improve the relationship of race grooves between the upper and lower surfaces of the bearing race. Race grooves, which provide a place for bearing elements to travel, are cut into the OD of the inner race and the ID of the outer race. It is critically important for the inner and outer race to be the same height and for the grooves to be in the same place for maximum bearing performance. The company needed a way to take different amounts of stock from the upper and lower surfaces to center the groove as best as possible. WHAT MAKES HONING SO SHARP? Most shops have an ample supply of common resin-bond wheels in their grinding departments. Lately, advancements in wheel construction have helped bring down the cost of wheels, giving users a choice between different types. 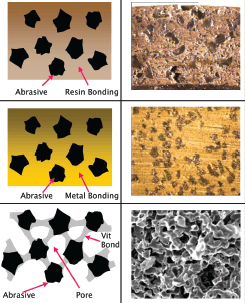 Do you know which type of bonding is best for your application? Here is a brief guide for three popular types of grinding wheels and their characteristics. However, in the past, the use of very hard abrasives has meant increased heat buildup, and reduced cutting speed. Flat honing solves this problem by mounting the wheels in a rigid frame that can exert as much as 1,000 pounds of force during a cut. Use of great force allows the wheels to remove stock quickly, yet leaves finishes that can be considered honed or even polished. A typical finish for the bearing races made at Emerson Power Transmission is less than Ra 10 micro-inches on the first pass. Stahli development teams took special consideration in solving heat buildup and loading problems by limiting the amount of abrasive used to make the wheel. Constructing a solid, 2-foot-diameter, solid super-abrasive wheel would not only be cost prohibitive, but also would not provide the stiffness necessary to apply sufficient force for fast removal rates. The current design uses a metal-backed wheel that contains thin wafers (5 to 7 mm thick) of abrasive strategically placed on the disk. The wafers are attached using proprietary cements that allow the wheel to “breath” during operation. 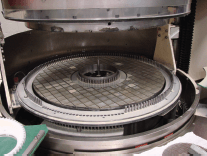 The density, composition and placement pattern of the wafers all affect cutting performance. Typical grinding involves moving the part back and forth under the wheel to remove stock. The leading edge of the wheel always wears down first, and dressing is soon required. With the flat honing process, the actions of the upper wheel are completely independent of the actions of the lower wheel, allowing the part to spin between the cutting surfaces in what is called planetary kinematic motion. In more visual terms, part motion resembles the spiraled path traced by a child’s toy called the Spirograph. The part moves in elliptical circles between the wheels to make use of the entire cutting surface at the same time and ensure that the wheels wear evenly between dressings. The programmed rotational speed of the upper wheel is independent of the speed of the lower wheel. Speeding up the lower wheel removes more stock from the bottom surface. Likewise, speeding up the top wheel removes more stock from the top surface. This independent motion is highly useful in centering the track in the race, thus improving part accuracy and making a key adjustment that was impossible with the old system. With the old grinding and honing process, the parts traveled loose in the machine. With the new flat honing process, a part-carrier accompanies each part and induces the spinning action between surfaces of the wheels, which rotate at speeds independent of each other. Anticipating flat honing’s far-reaching effect on quality, Mike Baron, a manufacturing engineer, made carriers in advance for nearly every size bearing made in the cell. He is developing a new strategy that processes the inner race and the outer race simultaneously in the same carrier. This effectively uses the outer race as the carrier. Capitalizing on this insight improves quality, ensures that races are exactly matched and further reduces assembly time. means setups can be performed in as little as five minutes—just enough time to change recipes, part carriers and bearing races. The cell’s primary operator is Kenneth Brook. Mr. Brook takes great pride in making the best product possible with the Stahli in the shortest amount of time and has been instrumental in helping perfect the machine’s recipes. Operator Kenneth Brook (above) checks this outer bearing race for size and parallelism. Since using the flat honing technology, he’s able to make parts more precisely. At left, Mr. Brook and manufacturing engineer Mike Baron review the recipe parameters between cycles. The two employees worked together to make the transition to flat honing a smooth one. 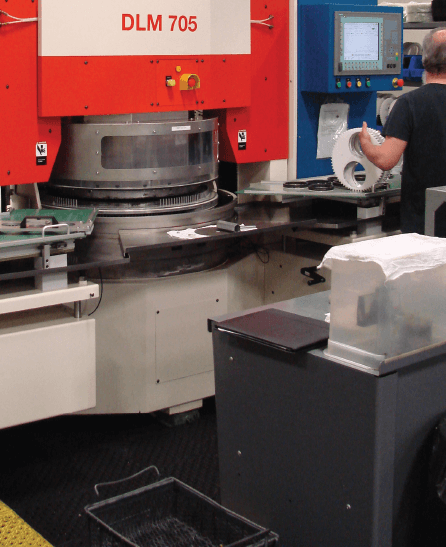 Manufacturing processes are designed to hold tolerances and make parts in the required cycle time. That’s expected. However, some of the unexpected benefits of implementing the flat honing system have to do with the effect it had not only on parts, but also on everyone who worked with the parts. For example, with the old system, a 0.0002- inch indicator was adequate to see part-to-part variations. The new system requires a much better indicator (20 millionths inch resolution) to see part-to-part variations. In short, this bearing cell now needs tools with much greater resolution to measure and record part characteristics, and the operators are not the only ones taking notice. By overcoming production challenges, Emerson Power Transmission can unlock new markets and have the keys to open doors that couldn’t be opened with old processes. In the meantime, Mr. Keim doesn’t have to worry so much about the tone of meetings with customers. It’s more likely they will be discussing new business rather than certain “uncomfortable” topics.